Most restaurants and shops don't put a lot of money or time into designing a memorable bathroom. That said, you can sometimes find a truly memorable and bizarre place to take care of your business. 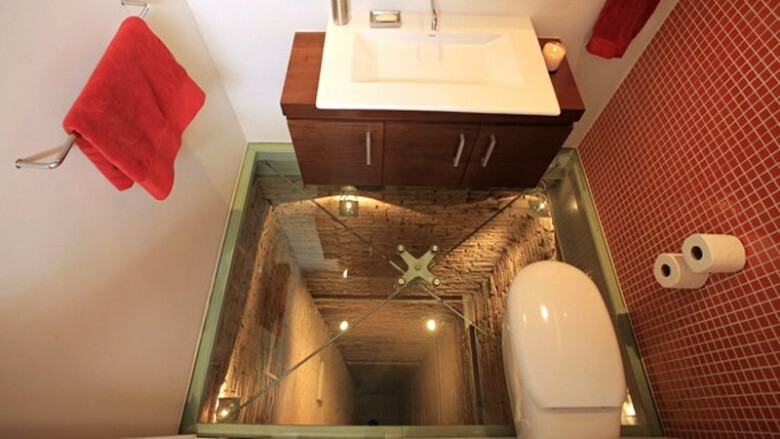 Here are some of the most bizarre bathrooms found across the globe. Most people prefer their bathroom time with as few eyes on them as possible. The Mumin Papa Café in Akashi, Japan, clearly doesn't share this little hang-up — they've designed a beautiful, if not bizarre, bathroom for their visitors to use. 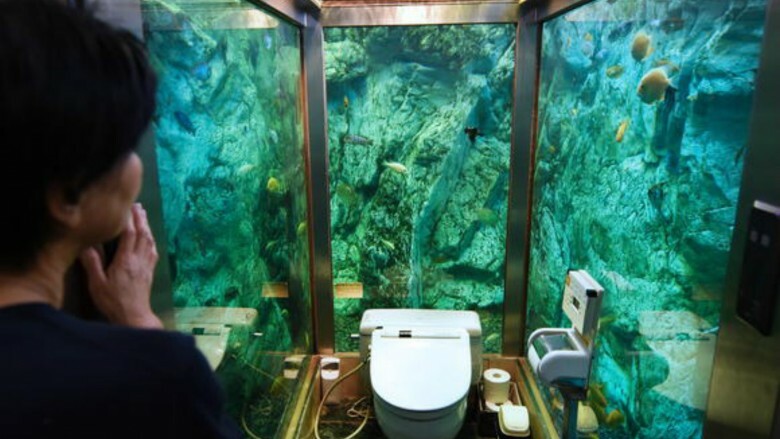 Accessible via an elevator, the bathroom sits within a giant, three-walled aquarium filled with fish, turtles, and a beautiful coral reef community, allowing dozens of pairs of eyes to scope you out while you drop a deuce. Taking a look at the setup, you can clearly see they didn't waste a dime when constructing this little aquatic getaway. The restaurant owner shelled out 30 million Yen ($263,000) to build it, which is certainly more money spent on ensuring your private time is as lovely as possible than the average restaurant might shell out. Unfortunately, this commode is only available for the ladies. Gentlemen, you'll just have to deal with the usual urinals, silence, and lack of eye contact you get from just about every other bathroom in the world. China is known for a lot of things, like its incredibly large population. Currently, China houses over 1.38 billion people — when you add them all up, that's a lot of people peeing and pooing. The people of Chongqing, China decided to do something about this, and built for themselves the world's largest bathroom. They didn't just go with endless rows of toilet stalls and urinals — as you can see from the picture, there are a lot of options when it comes to doing numbers one and two. The building consists of an Egyptian-themed façade holding more than 1,000 toilets within a four-story building. The overall space within is a whopping 32,000 square feet. It isn't just about taking care of one's business either. "We are spreading toilet culture. People can listen to gentle music and watch TV," explains Lu Xiaoqing, an official from the tourist area where the bathroom is located. "After they use the bathroom they will be very, very happy." And not just because they're suddenly three pounds lighter. Though it's just a bathroom at the end of the day, it has become something of a tourist attraction. At least a tourist checking out the building and taking pictures, shouldn't have a hard time to find a place to take a break and relieve themselves. This particular bathroom is something of a pop-up art project that has been seen in London and Switzerland. The project was the brainchild of architectural artist Monica Bonvicini, which she titled, "Don't Miss A Sec." The bathroom is a fully-functioning facility encased entirely in one-way glass — when you are on the inside, you can see everything outside of the box, but nobody can see you. The point of the odd commode was to see how people would react to "Seeing but not being seen" while they are doing their private, nasty business. The title may be a bit misleading (it's not really "public" if people can't see you), but it referred to the artist's observation of people visiting an art opening. She notices that people were afraid to leave a room in case they missed some key comment or unveiling. From this, she came up with "Don't Miss A Sec" to reflect a person's reluctance to leave a spectacle, but remain in the action—even if that action involves them sitting down for a few minutes and creating a brown-tinted masterpiece of their own. There are several locations across the globe that feature a urinal allowing a man to pee into what is basically a person's giant mouth. Ok, that description was pretty nasty, but looking at the picture, you can see what we mean. In the Rolling Stones museum found in Mönchengladbach, Germany, the urinals aren't just an interesting oddity and homage to the museum's subject — they are a source for controversy. A group of women's rights advocates targeted the museum back in 2012, demanding the urinals be removed because they viewed them as sexist. Women's rights activist Roda Armbruster helped lead the (Unsuccessful) campaign to have the urinals removed. "That's discrimination against women," she told regional broadcaster NDR. "Why does it have to be a woman's mouth? If it had been based on the emblem of the Stones with the tongue, it would have been OK. But the tongue's been left out and they really looks like women's mouths." The museum operator refused to remove the urinals and they remain there to this day. Sorry, protesters — you can't always get what you want. On occasion, a city may want to provide lavatory facilities for their residents, but might want to hide them from view. After all, bathrooms aren't necessarily the cleanest or most picturesque things to look at, and they tend to take up a lot of space that could be used for other things. Taking advantage of this is a company called Urilift, which specializes in producing urinals that are built into the ground, and rise up when in use and sink down when not. 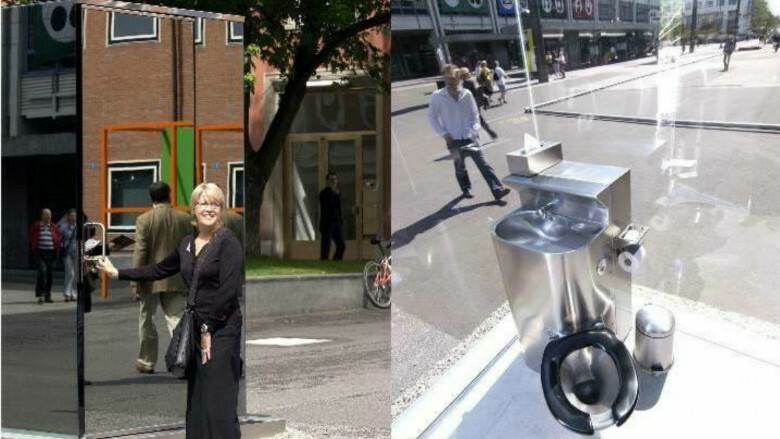 These handy little pods are called Popup Urinals, and they're, well, popping up in cities all over. 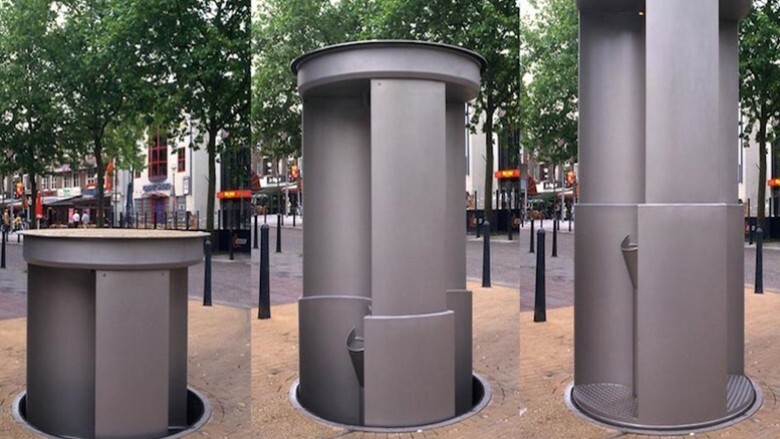 Popup urinals are designed to fit within existing manholes, replacing the traditional cover. This allows for the urinals to be used and displayed only when needed. Of course, a special little hideaway place to pee doesn't come cheap. Construction and installation costs come to a whopping $124,000, but cities are willing to pay such costs to ensure their public squares remain neat, orderly, and pee-free. Have you ever been out swimming in a lake, or maybe fishing from a boat, and had to take a leak? You held it until you got back onshore and found a bathroom, right? Of course you didn't — nobody does! You either made yourself a nice, warm spot in the water, or let loose over the side of the boat. 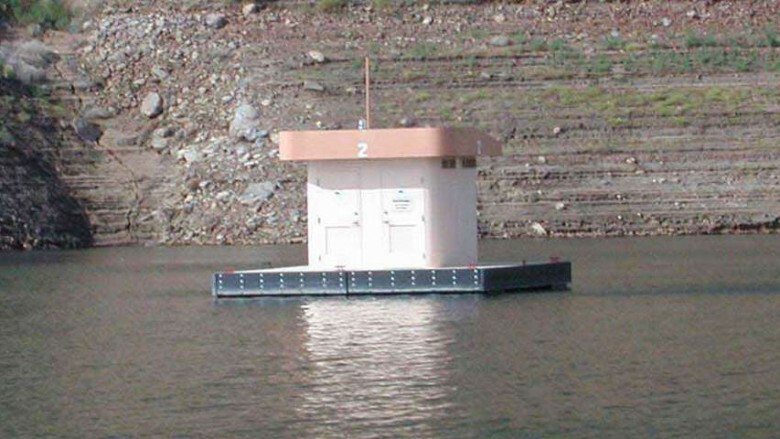 Well, the folks who manage Lake Powell in Utah wanted to put a stop to such practices, so they constructed a floating bathroom, free for all to use. Now, you're probably thinking that Lake Powell is pretty large, and just one of these won't cut it. Well, the caretakers of the lake agree, and they've placed them all over so you can feel free to boat and play, knowing a toilet is never too far away. Sadly for the restroom connoisseurs of the world, this particular example of a bizarre bathroom sits in a private home. 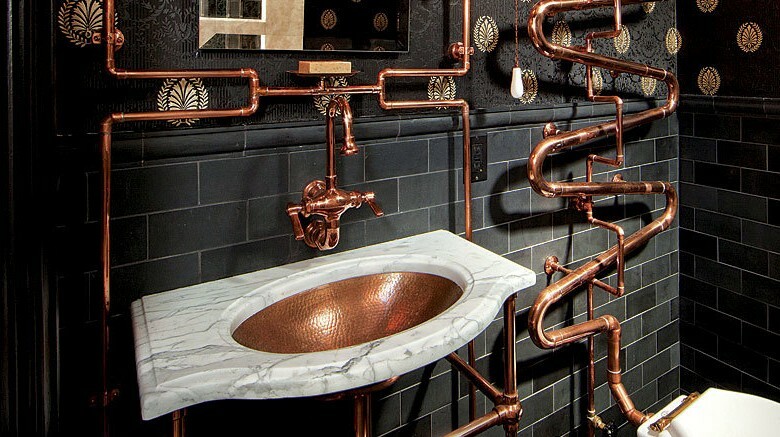 The bathroom was designed by architect Andre Rothblatt for some clients who just had to get their steampunk fix on. Rothblatt based his designs on his studies of Rube Goldberg (the guy who gave us those wonderfully complex machines that accomplish simple tasks) and even installed a Victorian high-tank toilet, which sits near the ceiling on a very long, folded copper pipe. It's unknown how much the whole project ended up costing, but it's clear from the picture that it wasn't cheap or easy to install. The final design required a contractor, plumbing consultant, and a light designer/fabricator to help bring the whole idea to life. All of the piping is functional-but-exaggerated, and even comes topped off with a PSI valve gauge and a marble-topped console vanity with a copper sink and faucet. Granny Grannyboot's is a home located near San Francisco's Potrero Hill, consisting of rooms designed and assembled by her many grandchildren. Each room comes with a theme, and the bathroom features one of the best of them all: an homage to The Beatles' Yellow Submarine and Terry Gilliam's Brazil. The bathroom is called "Gaudi Submarine" and features a tiled mosaic across each of the walls and ceiling depicting an ocean setting. The bathtub has illustrations of portholes with The Beatles looking out in the same way they did in the animated film based off their hit song. There's even a brass periscope handing down from the ceiling, though it's not clear if it actually looks up into the next floor. Let's face it—that would be both creepy and awesome … but mostly creepy. Have you ever thought to yourself while taking a poo that you were particularly vulnerable and could be shot at any time? 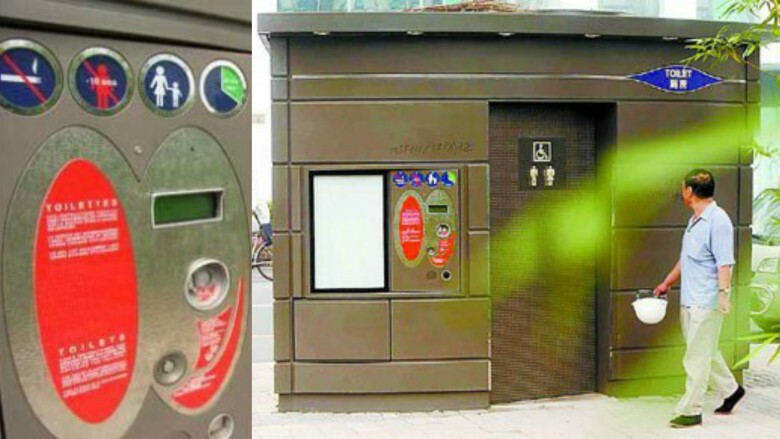 Well, if you happen to live in Beijing, China and live in absolute fear for your life while using a public can, have no fear! The bulletproof bathroom is here to help keep you safe … for some reason. Not only is this bathroom bulletproof (and it really is), it's also capable of withstanding explosions. The bathroom was designed as an anti-terrorism product, many of which have arisen in the country following 9/11. This thing is built Tonka-tough, weighing in at a whopping 15 tons, meaning a truck driving at 60 mph could hit this thing and do virtually no damage at all. Funny thing is, barely anyone in the Zhong Guan Village Plaza uses the $100,000 facility, perhaps because the instructions are in English and French, which makes a lot of sense since it's in, you know, China. When a company like Dolce and Gabbana decides to open a Milanese restaurant and bar, they don't exactly go for a minimal approach. The place is called Gold, and everything in the entire place is covered in gold, including the light fittings, staircases, and—you guessed it—the bathroom. If you ever want to enjoy dropping a deuce in the most elegant and refined bathroom in the world, look no further, Gold is for you. The bathroom comes fixed with some — and this is an odd way to describe a toilet — beautiful places to take care of business. 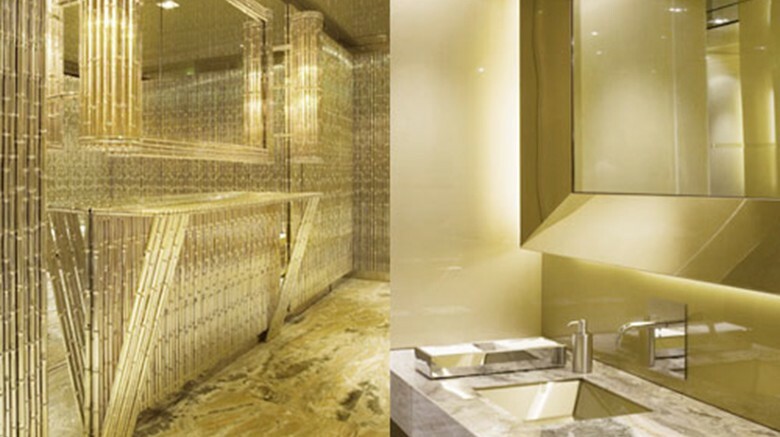 Gold-lined sinks, gold wallpaper — you get the idea. The place is bedazzled in gold so much that it's pretty obnoxious, but you should still check it out anytime you visit Milan. It probably won't surprise you to learn that a place called Gold, filled with gold, isn't cheap. An average plate of food will run you somewhere between $33-$131, so plan accordingly and make sure you drink enough so you have to go and at least do number one. Otherwise, there isn't much point in going there in the first place. Imagine you were renovating a penthouse apartment in a lush, 15-story building, and found an unused elevator shaft meant for a second elevator. You might go ahead and install that second elevator, or even lay down a floor and create a new space, which is exactly what the architects at Hernandez Silva did when they came across that very situation. They constructed a glass-bottom bathroom so frightening, it will effectively scare the reason-you-went-there-in-the-first-place out of you. The renovated apartment is, sadly, a private residence, so only the owners and their guests get to appreciate the sheer terror of the long drop that would even make people who aren't afraid of heights a bit uneasy. The glass in the picture certainly looks like it could support the weight of a moderately-sized T-rex, but the addition of reinforced metal crossbeams might make some folks think twice. Pee at your own risk, if you can find the place and score an invite. 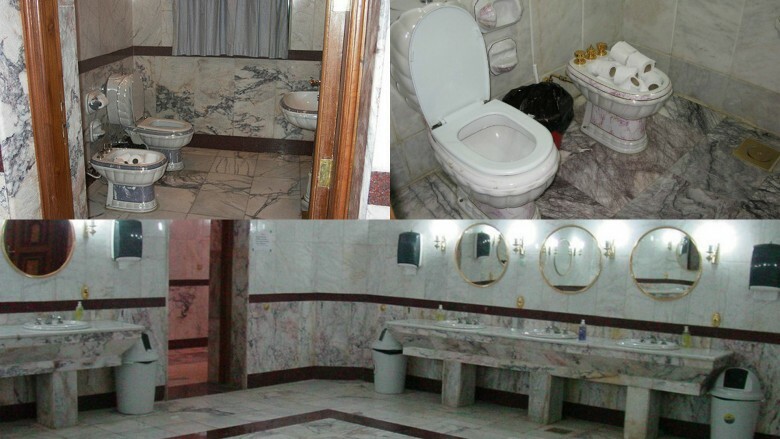 In Saddam's former palace in Baghdad, many a military person found a ridiculous amount of marble. The walls, ceilings, stairs, and even the bathrooms are covered in marble. Everything in that bathroom is marble too, including the uniquely designed toilets and sinks. Some of the toilets even have gold inlay and painted designs. Al Faw Palace was the location where diplomats would visit the former dictator of Iraq, so it was meant to display a certain level of opulence and style. The bathrooms are also equipped with like-designed bidets, but being that it was most recently occupied by the United States military, they were stuffed with toilet paper rolls (Yanks just don't know how to use those things!). Other than that, United States Central Command maintained the bathrooms in pretty much the same way Saddam did, since it remained the location people would come to visit whenever State Department representatives and politicians would visit the embattled city and had to their official government duty. 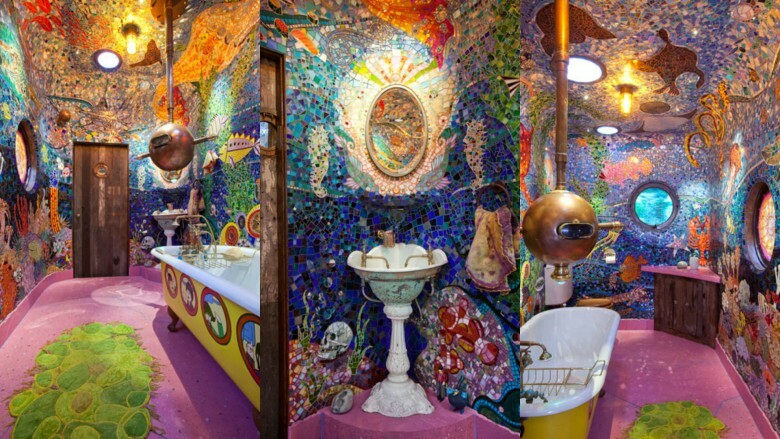 This bathroom is both bizarre and beautiful. It was designed by architect Naruse-Inokuma, along with botanical artist Makato Azuma, and they called it "The Superlative Space." The room makes great use of star, white walls, and live foliage, along with pristine bathroom fixtures to make up this amazing space. The room was designed as part of HOUSE VISION 2013 in Tokyo, Japan, an art and architecture exhibition featuring the futuristic Japanese home. 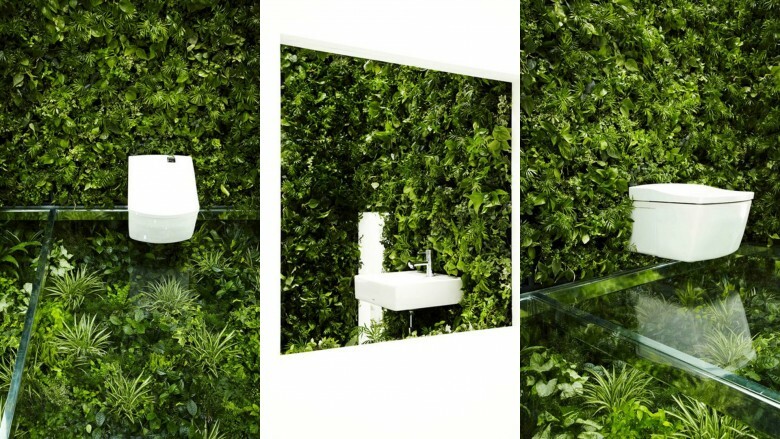 While this is certainly a beautiful room with functioning bathroom equipment, one has to wonder whether or not some people might feel inclined to "water" the plants, whenever they felt nature calling. Have you ever watched those crazy science-fiction flicks from the 60s and noticed everything was in a pod of some sort? The people behind the design of the bathrooms in the London restaurant Sketch must have been big fans of those films, because stepping into their bathroom is like walking into one of those movies. The restroom is filled with large pods, like that scene in Alien when John Hurt's face befriends a facehugger, only much nicer. 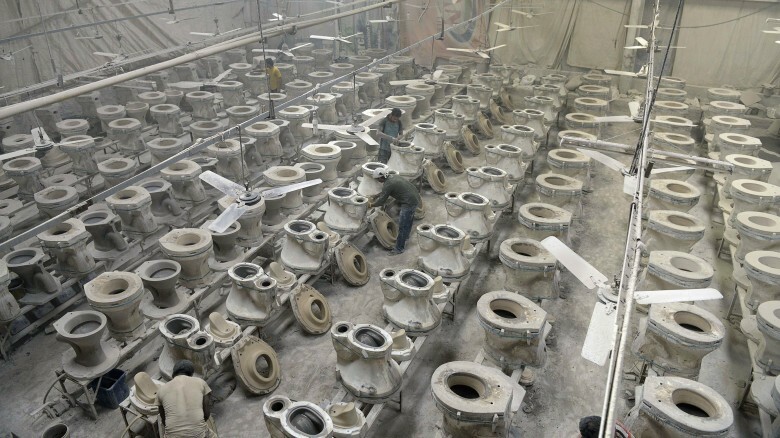 Each pod is larger than an average person and contains a single toilet. And don't think of these as permanent port-a-potties or anything — they are very well designed, and oddly beautiful in their own way. 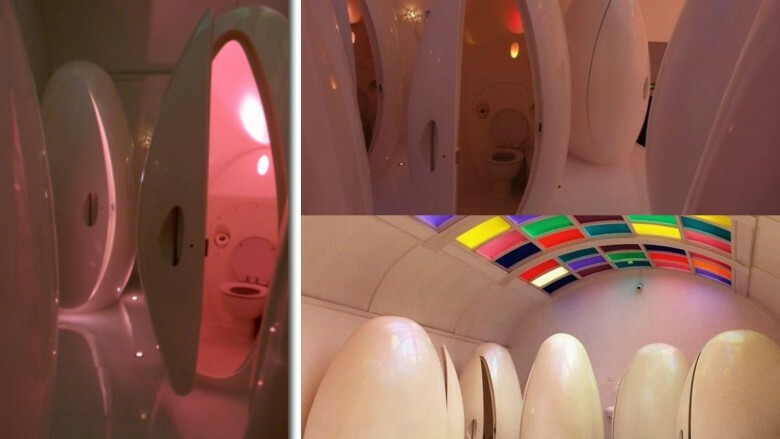 The design of the pods isn't the only thing about them that makes this bathroom unique — each pod is mostly soundproof, featuring both color-changing LED lighting and futuristic music playing inside. So when you're in London and ate so much, you feel like a chestburster is milling about inside you, you know where to go.